In addition to Jim Caldwell, the Packers have also interviewed former Colts head coach Chuck Pagano for the team’s head coaching vacancy, the Milwaukee Journal Sentinel’s Tom Silverstein tweets. 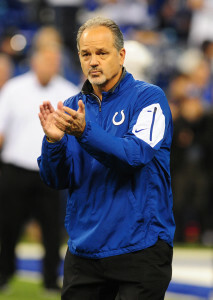 He could get his wish with Green Bay, which has interviewed at least him and another former Colts head coach in Caldwell. In his first three seasons in Indianapolis, Pagano led the Colts to back-to-back-to-back 11-5 seasons in Andrew Luck’s first years in the league. He then authored consecutive 8-8 campaigns before finishing 4-12 while Luck missed the entire season with an injury. As Silverstein notes in his tweet, Pagano has significant ties to the Packers’ current staff, having worked with defensive coordinator Mike Pettine in Baltimore and having hired Green Bay’s current interim coach Joe Philbin with the Colts. Pagano spent this season as a consultant for the NFL working with officials. Packers cornering the market on interviewing crappy former Colts coaches. Apparently 53-43 and if you include playoffs 56-46 is crappy. In his 6 years in Indy he had 1 bad season and that was because Luck was injured, the guy coached them to an AFC champ appearance. I’m not saying he’s a good or even great coach but he’s definitely not crappy and he’s better than several current coaches and coaches that have got 2nd chances. When will they interview the ghost of Ted Marchibroda? Pagano is all Aaron Rodgers needs is another has been coach who can’t coach an elite QB. I don’t understand why these retreads keep getting retreaded. Pack is just filling time until the real contenders for job become available i.e. Fangio, McDaniels, Rivera. Rivera may get a pass in Carolina and even if he leaves I think the Packers would have zero chance of landing him since he has deep roots with the Bears. Why would Riverboat take a coordinator type job with the Bears instead of a HC job with GB or another team? I think the Bears will do everything possible to retain Fangio. This makes no sense. Just because of his “deep roots” with the Bears doesn’t mean he passes up a HC job if it’s offered. I think Rivera is just the guy the Packers need. Someone who can take over the defense and let Rodgers/OC run the offense together. Give Rodgers the defenses Cam has had in Carolina for 3-4 years in a row and Packers easily win 1 if not 2 titles. I would expect him to receive several HC offers if he became available but I don’t see him opting for the Packers. Caldwell and Pagano. No and No.